Caden has been playing Miracle League Baseball since Spring. It is a phenomenal program that pairs a child with a disability (physical or neurological) with a buddy who then helps them play baseball using whatever modifications the child needs in order to have a positive and successful experience. Everyone bats, gets as many opportunities as it takes to hit the ball, everyone runs the bases. No scores are kept and most importantly special needs kids get the chance to just be a kid. We also get the amazing experience of playing on a 100% accessible field thanks to very generous donors in the area who want to help give kids that opportunity to just be kids. Caden absolutely loves it and he absolutely loves baseball. He watches baseball just about every night on tv although he has no loyalty other than his team must be playing that night. Hence we follow the Reds, the Cubs, the Indians, the Brewers, the Twins and well anyone who is playing and winning. Of course I am biased but honestly he is really athletic. He hits well, he throws well, he catches well. Once we learn that the bat doesn’t have to be placed perfectlyin the hula hoop that serves to teach dropping rather than throwing the bat, we’ll be well on our way to an all-star baseball player. A few weeks ago Happy Bats started practicing in the grassy field beside the Miracle League field. They are the 4-6 year old beginning baseball players. I’ve been watching their practices a little and honestly they aren’t doing anything skills-wise that Caden can’t already do so I started to go to Jennifer World. You know the place where I get ideas that usually either backfire or get me in trouble? Baseball was wonderful. In fact he hit the ball on the first pitch and caught every ball that came in his direction. Because it was so hot though the coaches thought that ending practice with a water ball fight would be fun. The directions were to throw the water ball at someone you didn’t know in a mingle-meet-and-greet fashion. Nothing about this made sense to Caden and in record time he was down on the ground with the high pitch screaming/crying that probably called to dolphins in all corners of the world. Seriously if dolphins are found trying to swim upstream in the Mississippi River, you can bet that it was Caden’s crying to blame. Thankfully it was hot enough that few birds were out so there wasn’t a mass falling from the sky or anything but dang it was an epic melt down. My stay in Jennifer World came to a halt with a fiery crash upon re-entry to Ground Autism. Major kudos to Elf for immediately going to his feet and looking for a way in the field to get to his boy and much gratitude for the Miracle League staff for immediately removing Caden from the chaos and allowing him to play with a water ball outside of the field with just a few of the buddies. I also think though that they learned a thing or two from the “experience” because tonight when they combined Happy Bats and Miracle League due to another 100+ day and followed it with a water ball fight, the kids just tried to hit their buddy or a coach with the ball and vice versa. It was much more controlled chaos and even though Dan, Elf, and I were ready to deploy, other than a little heat exhaustion, the experience was a positive and meltdown free one. You might be thinking that this story ends on a sad note but the thing is it just doesn’t. Miracle League is awesome and we’ve recently found out that they are going to have Miracle League soccer in the fall. “Ironically” Caden has been talking about wanting to try soccer and here’s the perfect opportunity for him to just be a kid. Any tale that lets him live and love life is a happy tale to me. Caden absolutely loves it and he absolutely loves baseball. He watches baseball just about every night on tv although he has no loyalty other than his team must be playing that night. Hence we follow the Reds, the Cubs, the Indians, the Brewers, the Twins and well anyone who is playing and winning. Of course I am biased but honestly he is really athletic. He hits well, he throws well, he catches well. Once we learn that the bat doesn’t have to be placed perfectly in the hula hoop that serves to teach dropping rather than throwing the bat, we’ll be well on our way to an all-star baseball player. The language of autism is something that I have struggled to wrap my brain around for a while now. I read one well-written blog and I start to think one way but then another well-written blog gives me something else to think about. My initial reaction has been to say that autism is something that my son has rather than something he is. In fact, I’ve always said that Caden has a great smile, gorgeous blue eyes, a quirky sense of humor, and autism as an example. More recently though I started to wonder if the language choice was engrained in me because of my academic background. I teach people how to be effective communicators both in written and oral communication. In my discipline, we teach our students to be people-centered and that language creates reality. Therefore, if I talk about Caden as being autistic, then I am defining him by his autism rather than stipulating that autism is but one of his many components. But does the word choice really matter? I read another really well-written blog last week that made me again start to question whether it was simply semantics. Does it matter whether I say Caden has autism or if I say Caden is autistic? The second doesn’t flow easily from my mouth, but again I wondered if it was my sociological and communication background and more habit than anything else. I started to wonder if I could actually use autistic in every day conversation or maybe even in lectures that I give both on and off campus. I even thought about a research study to examine people’s perceptions and language choices to try to find the real answer to this question. One of the primary reasons that we worked so hard to get Elf was because we knew he would be trained to track Caden. When he panics or becomes overwhelmed, he hides. Unfortunately, hiding often involves bolting and said bolting has happened in stores as well as parking lots. Elf is awesome at what he does; the dog loves to track or more aptly he loves the hotdogs that come after a successful track. In many situation such as indoor tracks, open field tracks, and forest tracks he is really good at what he does. We are still learning together how to navigate subdivisions though where neighbors don’t appreciate you cutting through their yards to chase the scent or how to cross intersections without either of us getting hit by a car. We practice several times a week and we always will so that we can depend on Elf to find his boy. BUT we have started to wonder if we need another safety net for Caden. Although the times are limited, there are instances where we might not have Elf with us. The zoo or a nature reserve quickly come to mind as environments where Elf’s presence could be a disturbance to the animals who live there (although the law would technically allow us to take him those places). Other times we might not be there to handle Elf through the track such as at school. So we’ve started considering Project LifeSaver through a local sheriff’s office. You are thinking that I have gotten way off topic aren’t you? We’re almost to my point (hopefully)! Ryley made a casual statement to me that was anything but casual about how important it must be to Dan and I not to lose Caden given that he has a service dog and possibly a special bracelet. What she really wanted to know was if we would be as upset to lose her. We had a long talk about the differences of being verbal and nonverbal if you get lost and how she has an equally cool tracking device called a cell phone. In the end a potential crisis was averted but it helped me get a new perspective on the question I started with. 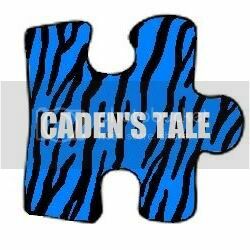 Does it matter if I say Caden has autism or that he is autistic? For me Caden has autism because autism is something that causes our family discomfort, inequality, and even pain from time to time. Both of my kids have immune deficiencies which mean if someone gets sick, everyone is getting sick. In other words they have something that affects us all. Caden’s autism is like that in our family. Sometimes melt downs are annoying inconveniences that only cost family members some time out of their day, but other times they signal a sensory overload that means we have to leave a festival sooner than planned, or that we can’t attend a fireworks show, or that we significantly alter plans in such a way to help reduce his anxiety or discomfort. I can’t let Caden be the cause of that discomfort, inequality, or pain for his sister, my husband, or I. To me autism isn’t who Caden is; I can’t think of Caden that way because as far as I am concerned he is absolutely and completely perfect. He however has a condition that makes life difficult and that difficulty sometimes spills over and affects the rest of us. So for me the answer is: he has autism. That’s the perspective that is best for me. It doesn’t mean that it is the perspective that has to be best for others. I think this is one of those I’ll respect your decision if you respect my decision kind of things just like we agree to do with ABA, vaccines, holistic therapies, and medications to name a few…or at least we should agree to do. Parenting is the journey from your heart being inside your chest to living outside of you in another human being. The journey is an amazing one consisting of an endless series of hurdles. At the top of each hurdle, we as parents hold our breath as we hope and pray our child lands safely on the ground on the other side. You know the hurdles—first steps, a bike ride without training wheels, the first day of kindergarten, a sleep over at a new friend, heading to middle school, first dates, driver’s license and the list goes on. The thing is, though, as parents we know the ground is on the other side and even if the landing isn’t soft they will be able to get up and jump the next hurdle most of the time. Sometimes, though, the hurdle is a little high and the landing is harder than our child can handle and we have to hold our breath until we are gasping for air wondering if we’ll ever be able to breathe again but yet most of the time they eventually get up and jump the next hurdle. It is a journey of ups and downs and special memories intertwined with heartbreak. But most of the time we know the ground is there and they will eventually get up and continue on with the journey. Parenting a special needs child means taking a journey too, but the journey and possibility that the ground is on the other side and/or that our child will get up to jump another hurdle is a lot less certain. I feel like we are constantly climbing a mountain but wow does this mountain have wicked weather and terrain. There are mudslides and blizzards and sheer rocks walls that seem near impossible to climb. Sometimes when we are lucky we have a support system that gives us the tools that we need to survive the harsh conditions; other times we are literally left out in the elements to our own devices. I have to tell you sometimesit gets pretty cold and wet and lonely out in the elements, but sometimes you come into a clearing and it is the most beautiful sight you will ever see. I can promise you that special needs parents never ever forget those clearings. We might know better than most how fragile that moment is and how precious those memories are because at any moment the landslide will come and we’ll be swept back down the mountain—how far down we never quite know. You always hear the cliché “treasure this moment,” but unfortunately as parents you don’t realize that the moments might not always exist. Caden was a preemie, and although his birth weight and initial vitals rivaled a full-term baby, within an hour of delivery he turned very purple and was rushed away. Over the next few days, he got pretty comfortable being held by the nurses and when we came home he fully expected the king treatment to continue and it did—he was held day and night. I can vividly remember thinking I just want to do something other than sit here and hold this baby for a few minutes. I had no idea that he would later develop autism, a condition that means he has a very hard time tolerating touch, let alone being held. But a few days ago he spontaneously ran over and hugged me around the legs, and because I now know how precious those clearings in treacherous terrain are, I could tell you what he was wearing, what exact part of my leg he hugged and even how hard he squeezed if you asked. Need another example? When Caden was around a year old we would play a game. I’d tell him to say mommy and he would predictably say daddy. We’d do this several times before I’d say oh okay Caden just say daddy and predictably he would crack up laughing as he said mommy. There aren’t words to describe how badly I wish I had that interaction—that voice, that word, that laugh and smile---on video tape. I didn’t, though, because what parent expects that in a few months all language including the precious sound of a child calling you mommy would be gone. When we come to those precious clearings now we videotape them until the recording time runs out because tomorrow they could be gone—now we know to treasure the moments because we’ve experienced the loss. The other thing about these clearings—they are so beautiful and peaceful that they give us a reason to keep hiking up this terrain. We know there will be other clearings if we just keep moving in the right direction. That’s why we spend so many hours in doctor’s offices, in therapists’ offices, at schools fighting for services, in human service organizations filling out forms, on Facebook entering giveaways, and even why we can make just about anything a therapy or learning moment. Caden adores bubbles; just so happens they are awesome for overcoming tongue thrust and working on mouth positions for articulation. Playing in the sand helps work on tactile defensiveness and fine motor skills while the crafts that he begs for work on hand-eye coordination. The swimming classes he takes teach him to swim while helping him overcome some sensory issues related to water, and Miracle League baseball works on peer interactions and rules while being a whole lot of fun. Did you know that you can use a Pokemon card to work on colors, numbers, and letters? Remember the part about being in the elements without all of the tools or safety line that we need, most of the special needs parents I know are pretty darn resourceful. We take what we can find, we get creative and we run with it. Criticize me for spoiling my child because he gets a video game for each and every infusion but we know that the anticipation of a game helps get him through the IV start and having the directions read to him while he watches YouTube videos about playing the game help him lay through 8-10 hours of infusion time. Plain and simple: it works and it moves us a whole closer to one of those beautiful clearings rather than pushing us back down the mountain. Those clearings are precious and we’ll do anything and everything we can as special needs parents to get to them. Maybe you can also learn from our journey how much you can and should savor every precious moment. I don’t know how far up the mountain we personally will get, but I can tell you that no matter how hot or cold or slippery or steep the mountain becomes we’ll never stop trying to reach the top. I know the ground is on the other side of that hurdle, I just don’t know quite where yet.